At a recent event I looked through all the pictures on my camera. It turns out that my 9 year old is better than me. I THINK this is a good thing, but I'm not so sure.. 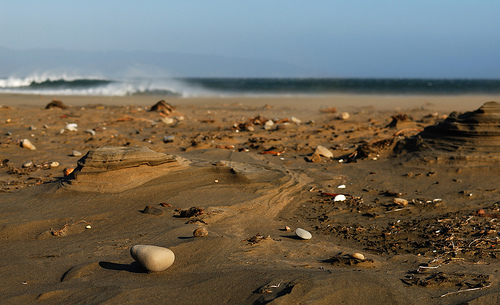 This is a shot he took at Drake's Bay which is part of the Point Reyes National Seashore. Even being on the lee side of Point Reyes, the wind was fierce and left heavy objects standing on the surface of the sand. Drake's Bay is reputed to be where Sir Francis Drake landed his ship the "Golden Hinde" in 1579. When I was younger, there was a brass plate which was supposedly left by Drake claiming California for England. It was later found to be a hoax perpetrated by E Clampus Vitus and the identies of the culprits were revealed in 2003. As an aside, Pt. Reyes is part of the Pacific plate and is sliding North along the North American plate. The border between them comprises the San Andreas Fault. The previous article is Migrating Projects from Project Server 2003 to Project Server 2007. The next article is Luck is where you find it - How to skip directly to Great without passing Go.